You can never be too young to spread the Frog! 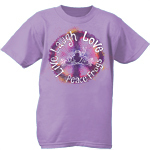 Some of our classic Peace Frogs products are now available in youth, toddler and even infant sizes! Select Short Sleeve T-Shirts, Long Sleeve T-Shirts and Loungewear sets come in Youth Small through Youth Large. It really does "Take a Village," so teach your kids and others to be Positively Peaceful with Peace Frogs!